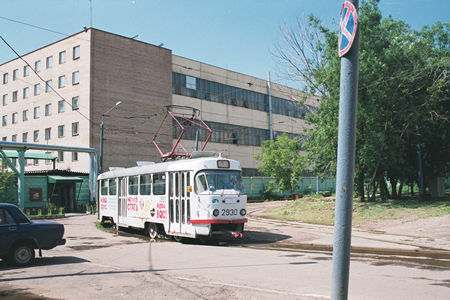 A tram station beside large machinery factory Borets was built in 1933, together with a tramline from Sushchevskiy Val street. For many long years trams carried huge crowds of factory workers for multiple industrial enterprizes of this district. Freight tram traffic was high here, especially during the World War II. But year by year the role of trams here declined. 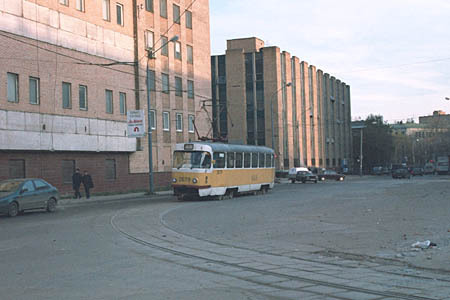 Freight transportation was taken by lorries many decades ago, more transportation choices became available with trolleybus and bus services in the nearby Sushchevskiy Val street. This district of vast factories is now suffering from the deplorable state of Russian economy, and the factories are surviving by leasing their shops for markets and offices. 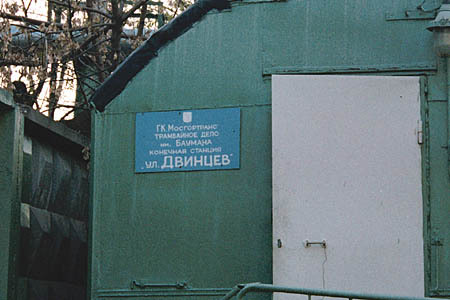 This line was doomed years ago because it was the last tramway level crossing on Sushchevskiy Val street which became a part of the Third Ring highway being constructed in Moscow. 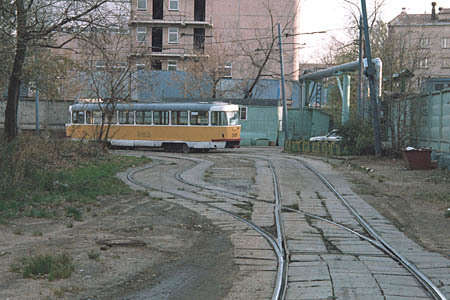 The only question had been when such closure would happen, and the primary reason for the line's survival was the only control room for a wast network of tramway routes that utilized this terminus. 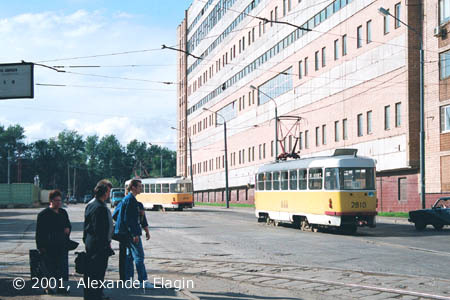 The final decision was taken in October 2002 by the government of Moscow: the control room would be relocated to Lesnaya Street terminus (circa 3 kms from this place), and the line from Minaevskiy Pereulok to Dvintsev Street would be closed. 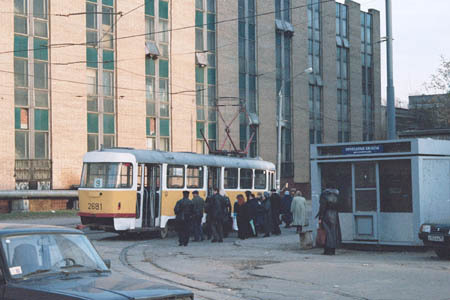 The last tram left this terminus for good late at night on November 1, 2002. 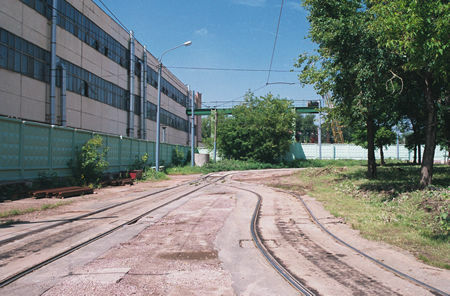 The abandoned tracks were left intact for a year or a bit longer, only a short stretch at crossing with Sushchevskiy Val having been paved over. Now no trace of the line can be found as the tracks have been lifted (excluding the crossing with Sushchevskiy Val where the rails are buried deep under the layers of asphalt). The control room is located in this old rebuilt carriage. The original building constructed in late 1930s has not survived until today. Trams are entering the terminus, one by one. Why - just because they must have left one of countless traffic jams along their route, completely with street running tracks. Tatra T3 #2679 is going to turn to the reversing loop. The track layout is very simple here - only two tracks. Here is a view of the home turnout. Another view of the tracks, now in the opposite direction. Tatra T3 #2930 is going to start its trip on route 9, with one of many factory buildings behind it. #2681 at the tramstop in the evening rush hour. Factory and office workers from surrounding industrial zones liked to use this route to easily get to Novoslobodskaya metro station, it usually took not more than 10 minutes to get there (if no car jam interfered).